NSF INCLUDES is a comprehensive initiative to enhance U.S. leadership in science and engineering discovery and innovation by proactively seeking and effectively developing science, technology, engineering and mathematics (STEM) talent from all sectors and groups in our society. By facilitating partnerships, communication and cooperation, NSF aims to build on and scale up what works in broadening participation programs to reach underserved populations nationwide. Read the latest Dear Colleague Letter (NSF 17-111) on an effort to expand the NSF INCLUDES National Network. The NSF INCLUDES Coordination Hub solicitation (NSF 17-591) seeks proposals for an initiative that will drive and support the work of the NSF INCLUDES National Network over its lifecycle. Web seminars for the new NSF INCLUDES Dear Colleague Letter: Announcement of an Effort to Expand the NSF INCLUDES National Network take place on September 15, 2017 at 12 p.m. EDT and a newly announced web seminar on September 22, 2017 at 12 p.m. EDT. Announcement: NSF INCLUDES has issued 27 new Design and Development Launch Pilot Awards for 2017. 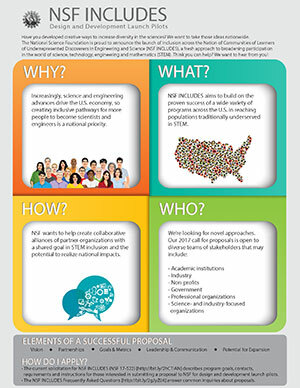 Current solicitations call for NSF INCLUDES Alliance proposals (NSF 18-529) and describe program goals, contacts, requirements and instructions for those interested in submitting a proposal to NSF. Find a list of recent awards made through NSF INCLUDES, with abstracts. The NSF INCLUDES Frequently Asked Questions answer common inquiries about proposals. The NSF Broadening Participation Portfolio provides context for NSF INCLUDES within the agency's portfolio. For inquiries, please email NSFINCLUDES@nsf.gov or contact program staff listed in the individual funding opportunity description. The impetus behind NSF INCLUDES is that broadening participation in science and engineering is a national challenge that requires national solutions. 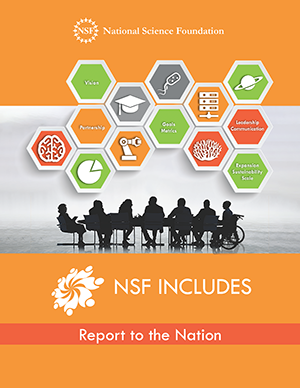 The approach of NSF INCLUDES is to develop networks and partnerships that involve organizations and consortia from different sectors committed to a common agenda. These alliances will work to find a solution to a specific STEM inclusion problem that has potential to realize national scale impact on the broadening participation challenge. NSF INCLUDES is specifically designed as a multi-stage, multi-year initiative, as detailed in the NSF INCLUDES program solicitation (NSF 17-522). 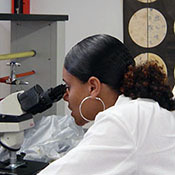 NSF understands that it often takes years to build effective partnerships and to test and evaluate various approaches. We're conscious of the challenges that projects and partnerships face, including the difficulties of adapting the best approaches for different communities and contexts and measuring their impacts. • Component one: design and development launch pilots. NSF INCLUDES design and development launch pilots will be engaged primarily in planning activities and laying the foundations for potential partners to share common goals and purposes through collective impact-style approaches. • Component two: alliances. The NSF INCLUDES alliances will leverage and build on the activities of design and development launch pilots, adding new partners, collaborators, or networks. Each alliance will have its own local communication organization. • Component three: NSF INCLUDES Coordination Hub. The NSF INCLUDES Coordination Hub will provide increased communications, interoperability, coordination, support, and accountability for the network of NSF INCLUDES alliances. The backbone organization will help drive overarching vision and strategy, align common activities, establish shared measurement practices, build public will, advance policy, and mobilize funding across the network. NSF INCLUDES is a strategic addition to the NSF portfolio that provides a different approach based on scaling social innovations through collective impact, networked communities, and/or strategic partnerships. NSF INCLUDES will build on and amplify other investments that NSF has made in broadening participation over many decades.